David Grissom has toured and recorded with John Mellencamp, Joe Ely, Storyville,The Allman Brothers Band, The Dixie Chicks, Chris Isaak, Robben Ford, The FabulousThunderbirds, Ringo Starr, Buddy Guy, Bob Schneider and John Mayall among many others. His songs have been recorded by Trisha Yearwood, Lee Ann Womack, John Mayall, Shannon Curfman and Storyville to name just a few. Over the years, he has been featured in Guitar Player, Guitar World, Musician, and Vintage Guitar magazines several times. David moved to Austin in 1983 and quickly became a stalwart on the vibrant local scene. Playing first with Lucinda Williams, he then joined Texas legend Joe Ely’s band in 1985, touring and recording nonstop until 1991, when he joined John Mellencamp’s band. David made three records with John and toured extensively from 1991 through 1993. After, Mellencamp, David went back to Austin to form Storyville, the band that included the Double Trouble rhythm section and powerhouse vocalist Malford Milligan. Storyville released two CD’s for Atlantic Recordswhich were well received at various rock radio stations. Since 2000, David has divided his time between recording sessions, including the last three Buddy Guy CD’s, among scores of other releases, touring with the Dixie Chicks, Bob Schneider and also playing hundreds of his own gigs, while still finding time to produce his CD’s and two releases for Ryan Beaver. In 2007 Paul Reed Smith Guitars introduced the DGT, David’s signature model guitar, which represents the culmination of a 25 year relationship working with Paul on the design and improvements of their guitars from a touring/session players perspective. David’s two PRS signature amps the DG-Customs, were just released in the Fall of 2013. David makes frequent appearances around the world giving guitar clinics and performing for PRS with their other artists, such as Orianthi, Brent Mason and Santana at NAMM, Musikmesse-Europe, Experience PRS-Japan / U.S., among various other shows. David has three prior solo releases, “Loud Music”, “10,000 Feet” and “Way Down Deep” which was released in 2011. His fourth CD, “How It Feels To Fly” includes eight new original songs recorded in studio and four extended live cuts, of which two find David paying homage to fellow hometown guitarist, Billy Gibbons with a blistering version of the Z.Z. Top classic “Nasty Dogs & Funky Kings” and the other, to his ex-band mates the Allman Brothers with a spot on performance of “Jessica”. The new CD will be released worldwide February 4th, with numerous shows in the U.S. and a month long, 25 city tour of Europe in March and April. 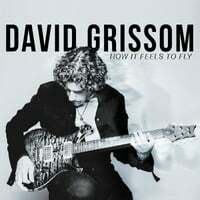 “How It Feels To Fly” shows David confidently settling into the role of bandleader and solo artist, fitting nicely with his well established Guitar Slinger reputation.